It seems almost strange to be typing out a post, more than two months since the last one. Not that I haven't considered posting something during that time, just that thoughts haven't wanted to coalesce around anything in particular. Work is not helping at all, since, at this point, it is slouching along to the end of a long project and, following a recent hitch, I am having to play at politics rather than get things done. In fact, I can't get things done as I am relying on others completely for the last step ! So, maybe I have enjoyed life a bit more, and perhaps also avoided chess (as a game) quite consciously. In fact my last chess action was when I visited the UK in the Summer and played a few games with a friend in London. Most enjoyable, even in the pub where we went. It got a bit lively ( the atmosphere near us, to be honest, not the games ! ) so as the (ridiculous) UK closing time approached, we finished up with a last beer and just chatting : also very enjoyable ! Catching the last tube back to the centre was an experience, since the tube I intended (the penultimate one ) failed to show : a concerning 20 minute wait for the next one ! 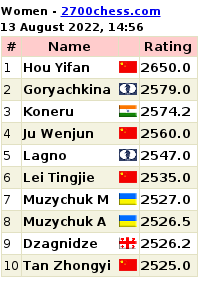 So what I have done since September in terms of progress in chess ? The only active thing was to sign up to the tactics site ChessTempo . I have consciously avoided sites like these in the past, and I have no real idea why. Maybe this was just the right point to start ? So far ( 25 online hours and 621 problems into it ) its immensely enjoyable, as it is a well organised site, an interesting mix of problems and has a great interface too. Lots of options to allow you to choose what you do and how you do it, and many notifications and achievements to keep the interest going. 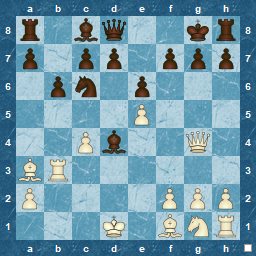 Its also an active site, with comments on the problems, voting on the problem 'tags' and a forum as well, with discussions on all chess topics. 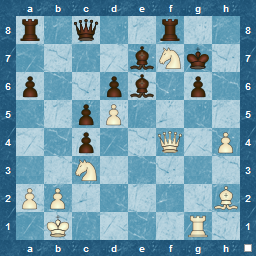 I know new problems are added regularly, since the problem I just solved was from the European individual chess championship from Gjakova in May, 2016, meaning this isn't a re-presentation of tactics from classic, or old, games : a major plus point. Today, I reached 1600 rating. Technically, I've returned to 1600, since that appeared to be the starting point for a new joiner. Not knowing exactly what I was doing for the first few problems dropped me right down to a rating of 1350 or so ( yes, I failed the first few, probably through a combination of moving too quickly, and frustration at failure) and I've spent the rest of the time crawling back up. 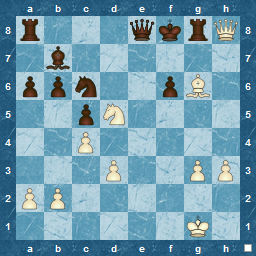 To give you an idea of what the problems are like, below are some, more-or-less random positions from the last 100 I have encountered, with a few notes, but no solutions given : you can find those on ChessTempo , and I give the link to each underneath the diagram.! This was rated as 1352, and I took less than the average time of 1:30 to solve it : a nice epaulette mate ! This next one, I failed. Actually, very frustrating, since I saw the key idea, but not the correct sequence. Losing points this way is not good, since the gain per problem is relatively small ( 0.5 - 1.5 points in general, I think, with a larger gain if your own rating versus the problem rating is a large difference ). The loss on this problem was -6.1, so you can see that failing a few in sequence gives yout rating a distinct hit ! The next ( below) was a very satisfying problem. There are a few options on moves here. 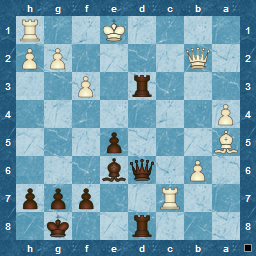 If I played this in blitz, I would have failed, but here, I came up with the correct solution, and was very happy with it ! Problem rating was 1562, and a I took a bit longer than the average 3:58, but it was worth it. Following is an example of a "non-mate" problem, despite its tempting 'mate-like' appearance. This is one of the good points of ChessTempo in my opinion. Not every problem is a mate, some seem an obvious gain of material, but tempered by the fact that there are a few alternatives available, so you are prompted to think things through before playing. Some are even finding the correct defence, which can be challenging. The key point is that you do not know what the tactic is, so you have to assess and work it out, and then play what you have confidence in. 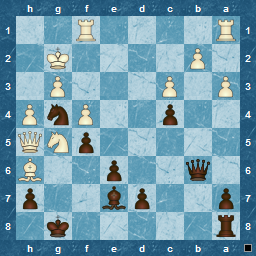 Here, the first move needs to be checked as perhaps it isn't what you would think to be the natural one. But after solving that, you also come up against a second problem, and have to resolve that before the full points are brought home. The below problem was the one that took the longest time amongst the last 100. 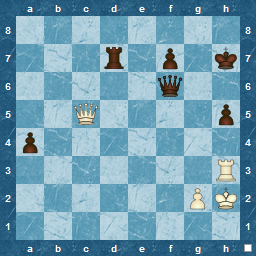 The surprise for me here was that the continuation was actually very few moves compared to the effort I put in to ensure I was happy with my initial move. This could be seen as an issue at times, since, if you feel confident enough, you could just play a move at a time ( without working out a full solution ) and get the points. There have been a few problems like that, the given solution stopping way before your calculations, assuming that you know fully why a move has been played. Lastly, here's the problem I solved the quickest, an enormous 32 seconds ! Yes, some are this easy, but even so, there is still a 'wrong' solution available. This can sometimes be a drawback of the site. I think the majority ( maybe even all ) of the problems are selected automatically by engine analysis, so sometimes what would evidently win in over the board, is a fail, even though in a real game it would be more than good enough. The solution you need to find is the exact one. However , the site does allow you to 'make a mistake' where there are plainly a number of good moves, but one clearly better move. 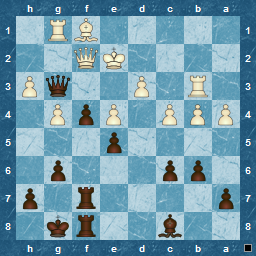 Overall, I can say that I am thoroughly enjoying the site and hopefully improving my tactics at the same time. If you want a shot at solving thousands of problems, mainly tactical , but also some specifically endgame, its worth trying it, after all its free !